Package: 100 tabs (25 mcg/tab). T3 Tiromel is an oral preparation containing 0.025mg of the substance Liothyronine Sodium per tablet. 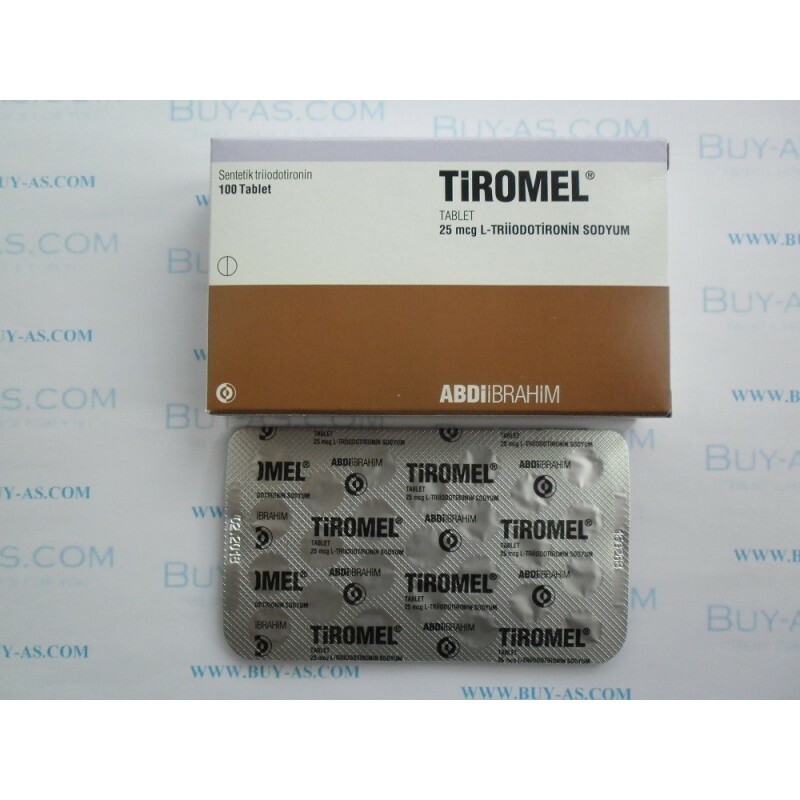 Tiromel is not an anabolic/andro-genic steroid but a thyroid hormone. As a substance it contains synthetically manufactured liothyronine sodium which resembles the natural thyroid hormone tricodide-thyronine (L-T3). The thyroid of a healthy person usually produces two hormones, the better known L-thyroxine (L-T4) and the aforementioned L-triiodine-thyronine (L-T3). Since Tiromel is the synthetic equivalent of the latter hormone, it causes the same processes in the body as if the thyroid were to produce more of the hormone. It is interesting to note that L-T3 is clearly the stronger and more effective of these two hormones. This makes Tiromel more effective than the commercially available L-T4 compounds such as L-thyroxine or Synthroid. L-T3 has proven to be 4-5 times more biologically active and to take effect more quickly than L-thyroxine (L-T4). 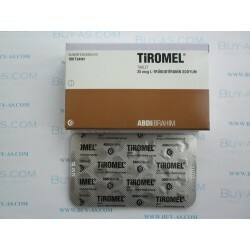 In school medicine Tiromel is used to treat thyroid insufficiency (hypothyroidism). Among other secondary symptoms are obesity, metabolic disorders, and fatigue. Bodybuilders take advantage of these characteristics and stimulate their metabolism by taking Tiromel, which causes a faster conversion of carbohydrates, proteins, and fats. Body builders, of course, are especially interested in an increased lipolysis, which means increased fat burning. Competing body builders, in particular, use Tiromel during the weeks before a championship since it helps to maintain an extremely low fat content, without necessitating a hunger diet. Athletes who use low dosages of Tiromel report that by the simultaneous intake of steroids, the steroids become mote effective, most likely as the result of the faster conversion of protein. To a great extent several body builders who are pictured in "muscle magazines" and display a hard and defined look in photos, eat fast food and iron this out by taking Tiromel. The over stimulated thyroid burns calories like a blast furnace. Nowadays, instead of Tiromel, athletes use Clenbuterol which is becoming more and more popular. Those who combine these two compounds will burn an enormous amount of fat. Tiromel is also popular among female body builders. Since women generally have slower metabolisms than men, it is extremely difficult for them to obtain the right form for a competition given today's standards. A drastic reduction of food and calories below the 1000 calorie/day mark can often be avoided by taking Tiromel. Women, no doubt, are more prone to side effects than men but usually get along well with 50 mcg/day. A short-term intake of Tiromel in a reasonable dosage is certainly "healthier" than an extreme hunger diet. As for the dosage, one should be very careful since Tiromel is a very strong and highly effective thyroid hormone. It is extremely important that one begins with a low dosage, increasing it slowly and evenly over the course of several days. Most athletes begin by taking one 25-mcg tablet per day and increasing this dosage every three to four days by one additional tablet. A dose higher than 100-mcg/ day is not necessary and not advisable. It is not recommended that the daily dose be taken all at once but broken down into three smaller individual doses so that they become more effective. It is also important that Tiromel not be taken for more than six weeks. At least two months of abstinence from the drug needs to follow. Those who take high dosages of Tiromel over a long period of time are at risk of developing a chronic thyroid insufficiency. As a consequence, the athlete might be forced to take thyroid medication for the rest of his life. It is also important that the dosage is reduced slowly and evenly by taking fewer tablets and not be ended abruptly. Those who plan to take Tiromel should first consult a physician in order to be sure that no thyroid hyperfunction exists. Possible side effects are: heart palpitation, trembling, irregular heartbeat, heart oppression, agitation, shortness of breath, excretion of sugar through the urine, excessive perspiration, diarrhea, weight loss, psychic disorders, etc., as well as symptoms of hypersensitivity. Our experience is that most symptoms consist of trembling of hands, nausea, headaches, high perspiration, and increased heartbeat. These negative side effects can often be eliminated by temporarily reducing the daily dosage. Those who use Tiromel over several weeks will experience a decrease in muscle mass. This can be avoided or delayed by simultaneously taking steroids. For the most part, since Tiromel also metabolizes protein, the athlete must eat a diet rich in protein.